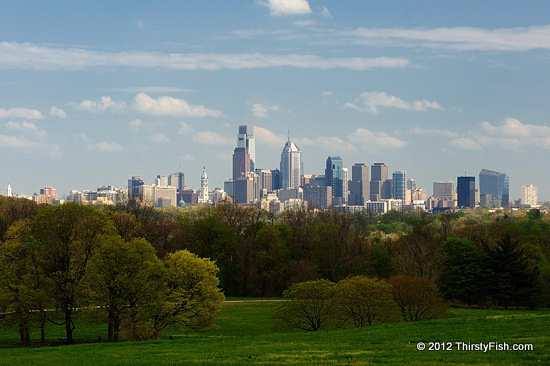 Belmont Mansion Drive in Fairmount Park offers one of the best views of the Philadelphia skyline. Center City is is approximately 3.5 linear miles away from this point. This is a rather careless photograph which was taken handheld, under mediocre light, and significant haze. I was too lazy to put on a polarizing filter which would have cut some of the effects of haze. Haze can be a serious challenge in long distance landscape photography. But, many hazy pictures can be salvaged by using post-processing tools to increase contrast - as was the case in this photograph. Although there is no substitute for good light, when we can not wait around for the perfect light, especially when we are traveling, it is reassuring to know that we do not have to discard low-contrast photos. Haze and fog can also make a picture. "Scuse me while I kiss the sky"